Mislatel consortium, awarded as the third telecommunications company, is promising to improve the internet speed in the Philippines but China Telecom, which is backing Mislatel, ranks low in worldwide rankings on internet speed. Filipinos pointed out that China lagged in worldwide rankings of internet speed thus making Mislatel’s promise of providing world-class internet speed questionable. Speedtest Global Index, an online ranking of the speed and performance of internet connections in the world, placed China at the 50th spot on the global average of mobile internet speeds while 18th for fixed broadband. China is also not included in the 2018 report of countries with access to fourth generation or 4G networks with LTE, a 4G mobile technology standard. According network research firm Open Signal, South Korea, Japan and Hong Kong led the list of the top three fastest internet speeds. Mislatel, a consortium of local Mindanao Islamic Telephone Company Group, the companies owned by Davao tycoon Dennis Uy and China’s own provider, China Telecom, promised to provide internet speeds up to 27 megabits per second in its first year. Last November 2018, the National Telecommunications Commission chose Mislatel as the country’s third telecommunications provider that will challenge the duopoly of Globe Telecom and PLDT-Smart. 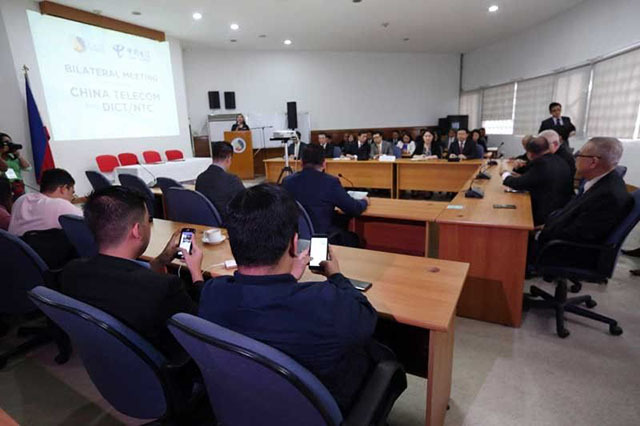 However, some Filipinos raised concerns on the cyber-security controversies that surrounded China Telecom, one of the largest telecommunications companies in the world. They also noticed the timing of the decision favoring Mislatel happened a day before Chinese President Xi Jinping’s state visit to the Philippines. China Telecom was accused in April 2010 of hijacking and rerouting 15 percent of the world’s web traffic for 18 minutes. A study in 2018 also alleged that the Chinese company has usurped or misdirected internet traffic into its own web infrastructure for many years. Meanwhile, others criticized the selection of Udenna Corporation and Chelsea Logistics Holdings Corporation, companies owned by Uy, a Davao-based tycoon with close ties to President Rodrigo Duterte. The validity of Mislatel’s franchise was heavily scrutinized during the Senate public services committee hearing last January. Senator Franklin Drilon said that Mislatel’s failure to operate a year after it secured a congressional approval of its franchise in 1998 violated its conditions of privilege, thus it was considered revoked. Infrawatch PH, an infrastructure policy think tank, also claimed that Mislatel Corporation failed to register the company with the stock market in 2003 thus losing the franchise. Congress gave the consortium until February 17 to provide the government with the necessary requirements such as a copy of its business plan and roll out plan before it can start operating in the country. Meanwhile, the Department of Information and Communications Technology said it is optimistic that the Congress can resolve the problems with Mislatel’s franchise. “Yung franchise ng Mislatel, it could be cured through an act of Congress because Congress gave the franchise in the first place so ‘yun ang pinagaralan nila ngayon (that’s being studied right now),” DICT Acting Secretary Eliseo Rio said.